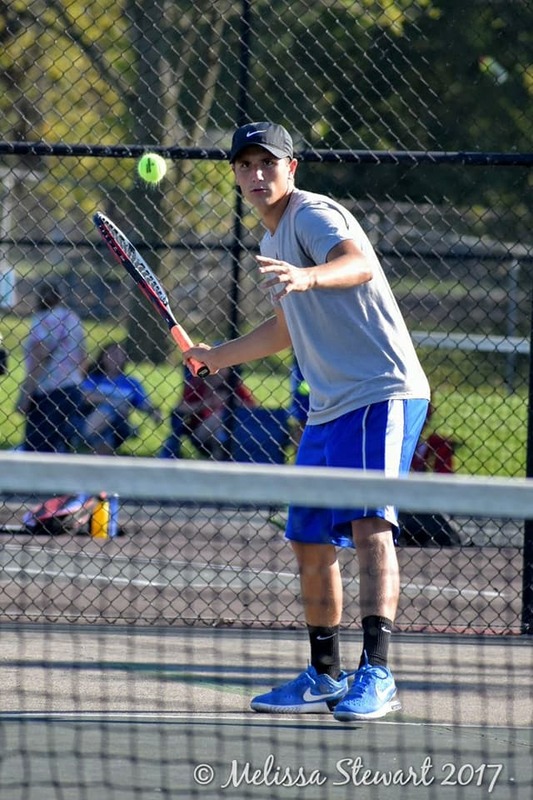 The Pirate tennis team avenged a mid-season loss to Borden in last night’s sectional semi-final when they pulled out three tight matches to overcome the Braves 3-2 in exciting fashion. After losing the first set at #2 singles 3-6, sophomore Eric Wigginton was the first of the Pirates to emerge as a winner with a 6-3, 6-2 comeback. Wigginton looked as strong physically and mentally as he has all season which is good, not only looking into tonight’s championship, but also into next season for the young Pirates. The #1 doubles team of freshman Brandon Broady and senior Jacob Roberts won their first set 6-4, dropped the second 5-7, but came back strong to win the match with a 6-2 third set. The #2 doubles team of freshman Alex Wright and senior Jase Smith ended the night, winning with lots of excitement. They dropped their first set 6-3, rallied back to win 7-4 in the second set tiebreaker, then finished off the Braves 6-4 in the third. Isaac Bates at #1 singles and Michael Gillooly at #3 singles were both defeated. The Pirates will take on the Silver Creek Dragons tonight in the Sectional Championship at 4:30 at Silver Creek. Come out and support the Pirate Tennis team! Eric Wigginton at #2 singles returns a serve. 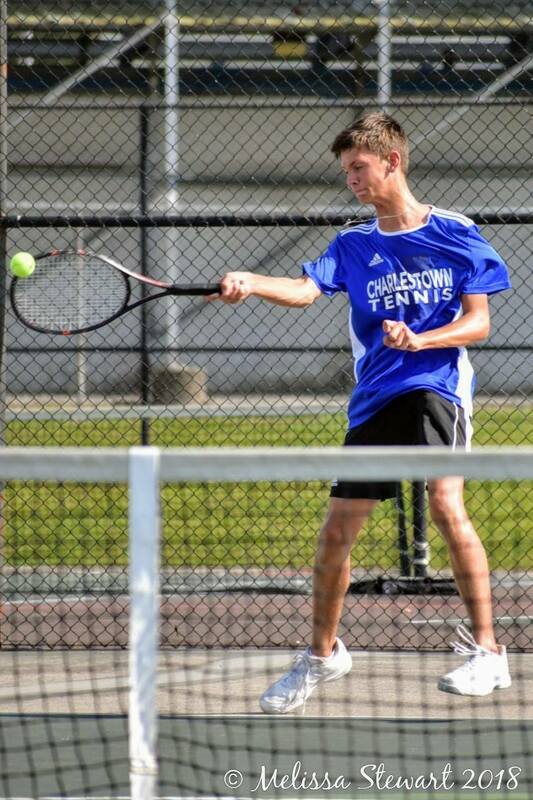 Coach Matthews and the Pirate tennis team traveled to Clarksville for a Mid-Southern Conference matchup and swept the Generals yesterday. 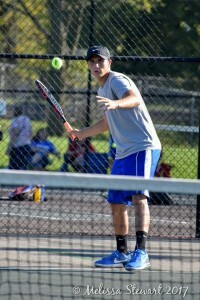 Senior Isaac Bates (#1 singles) won his match in three sets (6-4, 4-6, and 6-1). 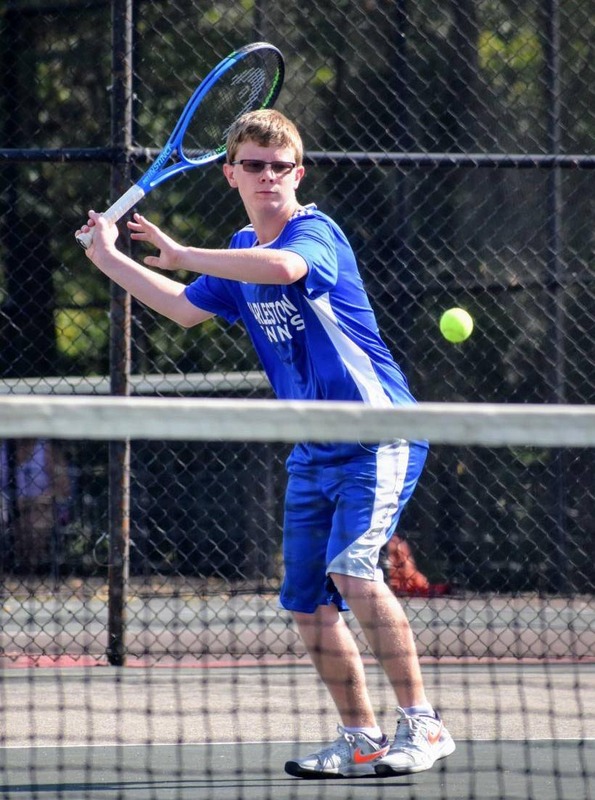 Sophomore Eric Wigginton (#2 singles) picked up his first varsity singles win in three sets as well, battling back from a 1-4 deficit in the 3rd set (6-3, 2-6, 7-5). To finish out the singles matches, Michael Gillooly (#3) prevailed in two (6-2, 6-2). At No. 1 doubles Brandon Broady and Jacob Roberts won (6-2, 6-2). The Generals forfeited the No. 2 doubles match. The Pirates are back on the courts tonight when they host Providence at 4:30 P.M. 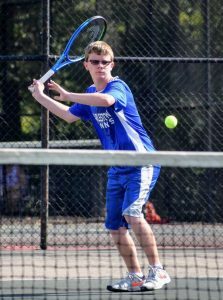 The Pirate tennis team claimed the home win last night against neighboring New Washington after previously losing to them just over a week before. Michael Gillooly won the only singles match for the Pirates, while both doubles teams of Jacob Roberts and Brandon Broady (1D) and Alex Wright and Jase Smith (2D) both recorded wins. Eric Wigginton lost a tough three set match at #2 singles (2-6, 6-0, 7-5) in only his 3rd singles match of the year for the Pirates. 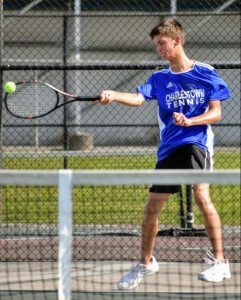 Charlestown HS Pirate Tennis improved to 9-3 & 4-2 MSC Thursday evening after hosting conference rival Corydon and shutting them out 5-0. 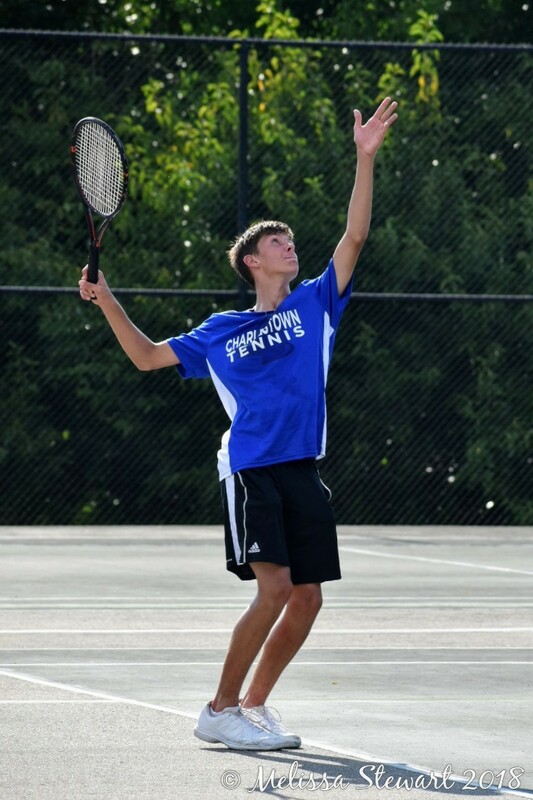 Steven Delaney won #1 singles, Jacob Doherty won #2 singles, and Alec Sipes won #3 singles. 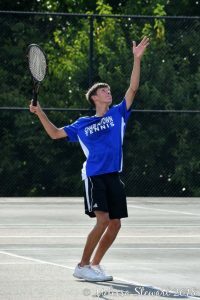 Chase Wray and Aaron Meyer won #1 doubles and Jacob Roberts and Isaac Bates won #2 doubles. The Pirates are back in action Monday afternoon hosting MSC rival Brownstown (4-3).